While the art scenes in Pakistan and Bangladesh are beginning to gain recognition, and Indian contemporary art continues to boom, Sri Lankan art is virtually unknown internationally. The handful of institutions in this country that do promote Sri Lankan work tend to do so in the context of South Asian art, with little focus on the country itself. Not a single Sri Lankan contemporary artwork has ever sold at auction in Great Britain. With so little attention paid to the scene, the popular impression of Sri Lankan art continues to be defined by the country’s most famous movement, the 43 Group. The collective was founded in Colombo in 1943, and sought to pioneer a consciously Sri Lankan interpretation of European modernism. The 43 Group artists, among them painter Harry Pieris and photographer Lionel Wendt, became renowned for their competitive strain of modernism. They remain the country’s most acclaimed artists, despite the group’s last formal exhibition being held in 1967. There followed a period in which Sri Lankan artists began to break with a perceived over-reliance on European modernism. Prompted by the developments of Abstract Expressionism and the New York School, a seam of abstraction developed. The time was a crucial one in the development of Sri Lankan art, with practitioners moving towards a sustained engagement with their chosen medium. 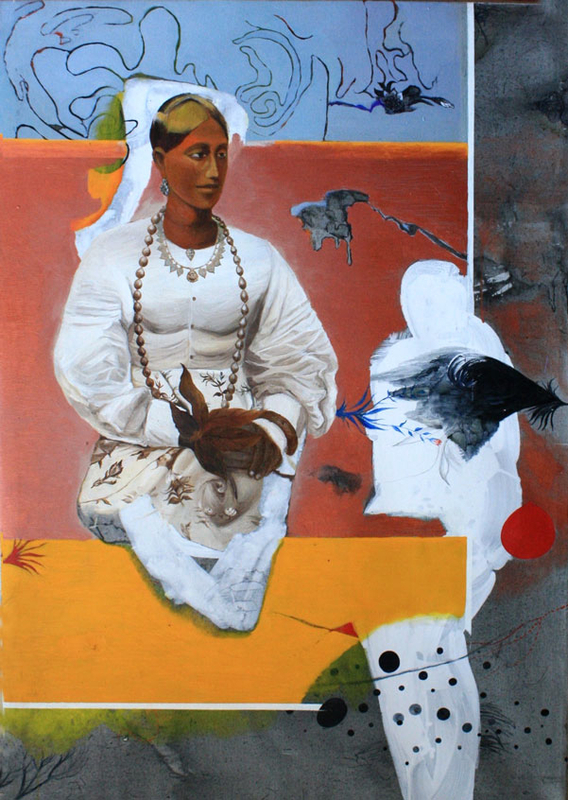 Sri Lankan art is said to have become ‘contemporary’ in the early 1990s. The ‘90s Trend’ ushered in a revitalisation of art, characterised by a heightened awareness of the theoretical and conceptual. Sculpture and painting (which continues to be the most popular medium) were now complemented by digital, installation and performance art. There emerged a concerted effort to employ art as a social and political sounding board. The civil war in northern Sri Lanka had by this time endured for twenty years. The conflict became the subject of explicit political protest in art, standing in stark comparison to the relatively benign themes favoured by the 43 Group. Art was no longer considered a pursuit outside society. Sensitivity to context became a priority, as compulsively communicated through the artwork itself. While Sri Lankan art was gathering momentum, its infrastructure kept pace, and more widely available arts education helped cement this growth. Established figures fostered young talent, recognising the need to nurture future generations and diversify beyond the dominant discourses of the leading voices. The University of Kelaniya was for some time the only institution that offered art to a degree level, but was joined by the Vibhavi Institute of Colombo in 1993. Younger artists converged on Colombo from all over Sri Lanka to learn, and the number of practising artists grew substantially. This in turn saw the theme of urban life infiltrating Sri Lankan art, with the capital city itself becoming a subject. While it would be reductive to posit a general Sri Lankan ‘style’ of art, it can be confidently argued that these artists share a commitment to exploring their Sri Lankan background. Sri Lanka is a small island which has experienced enormous upheaval over the last thirty years, which has in turn informed modes of expression and subject matter. Loose categories, which overlap and intertwine, can be suggested for the purposes of this article. The first of such loose categories brings together artists that overtly address political concerns. 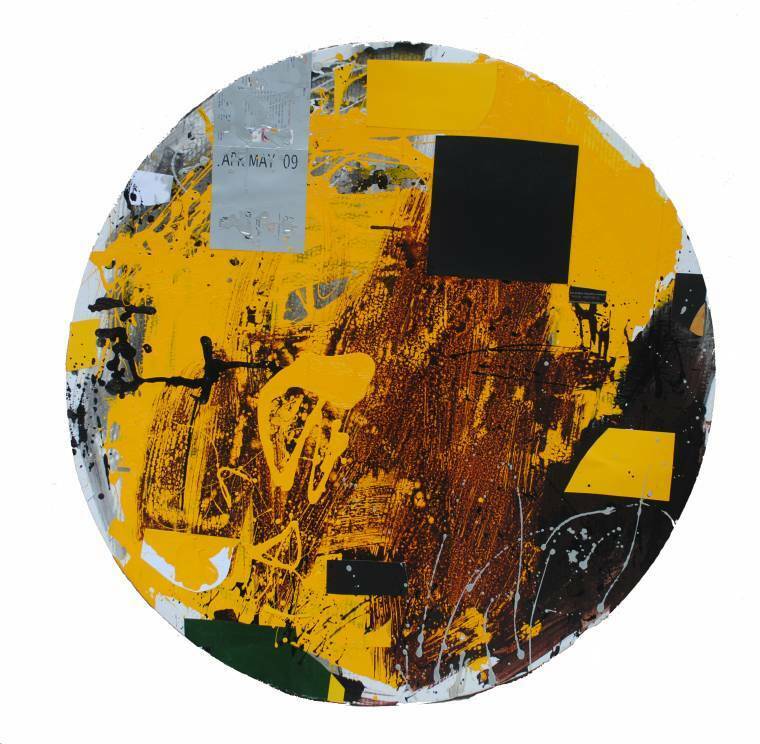 A second would collect those with more abstracted themes and styles, while another group of artists focus on the expression of personal and cultural histories. Associated with each of these groups are some exceptional young artists, whose emergence provides healthy competition for the more established generation. Vital to any discussion of Sri Lankan art is Jagath Weerasinghe (b. 1954). Weerasinghe has been a significant driving force in the development of Sri Lankan art since the early 1990s, and is presently director of the Postgraduate Institute of Archaeology at the University of Kelaniya. Weerasinghe coined the phrase ‘90s Trend’, recognising at the time the need for a cohesive framework to describe the activity of his peer group. He co-founded the Theertha International Artists Collective in 2000, which continues to foster new artists and initiatives. He describes current Sri Lankan artists as living in an era of ‘para-modernism’. 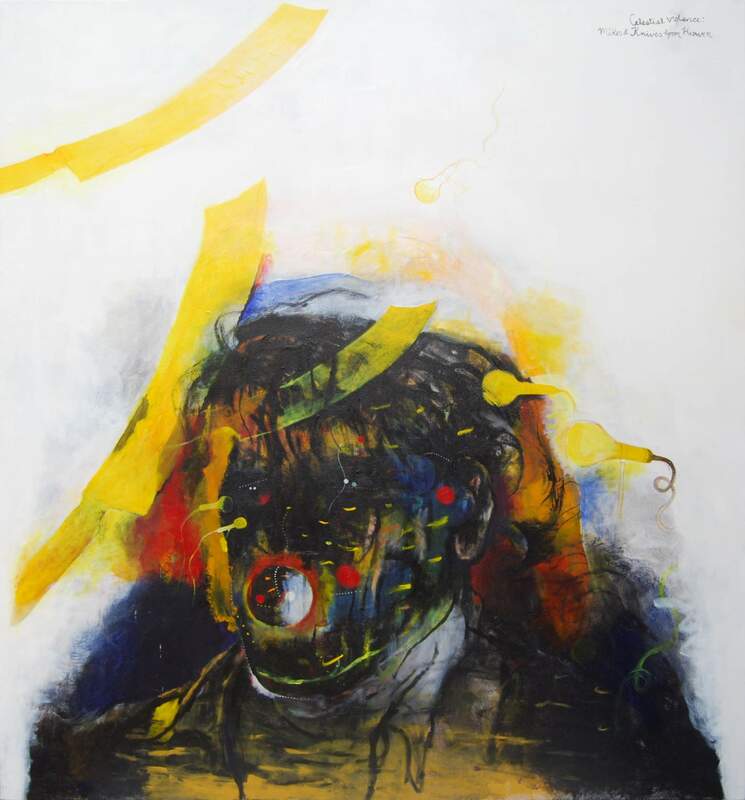 Weerasinghe’s own art, mostly as a painter and draughtsman, is deeply informed by his society’s actions. His work reflects an acute political consciousness, stemming from the ethnic riots in 1983 and the actions of the Marxist-Leninist Janatha Vimukkthi Peramuna (People’s Liberation Front) government between 1988-1990. Weerasinghe critiques Sri Lankan anxieties, responding to collective attitudes – as he identifies them – and taking themes such as nationhood, ethnicity, religion, identity and violence as his subjects. The artist’s work reflects his unresolved tussles with these subjects, as shown by his continued return to themes such as the Dances of Shiva. 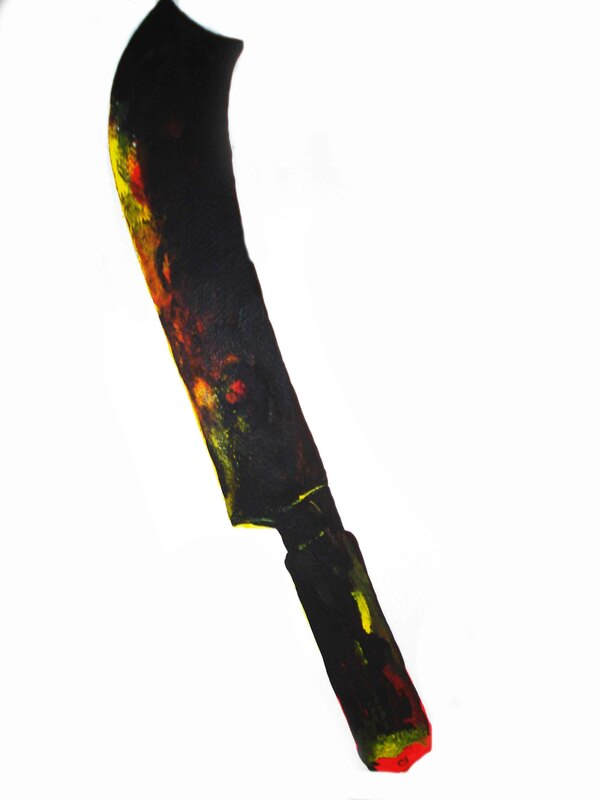 Dense acrylic and watercolour consume his picture planes in a whirl of feet and legs, stamping out evil in a fury of yellow, orange and black. These intense depictions allow Weerasinghe to explore the troubling contradiction of religious violence and the flaws of institutionalised devotion. Equally instrumental in the promotion of contemporary Sri Lankan art is Weerasinghe’s friend and contemporary Chandraguptha Thenuwara (b. 1960). Thenuwara is the Director of the Vibhavi Academy, a non-profit art school which he founded as an independent alternative to state-run art institutions. He has stated expressly that he wants his art to influence society through its impact on his audience. His vocabulary constantly regenerates in response to the changing political climate of Sri Lanka, contending that his work is driven by a creative response to ‘the destruction that is before us’. 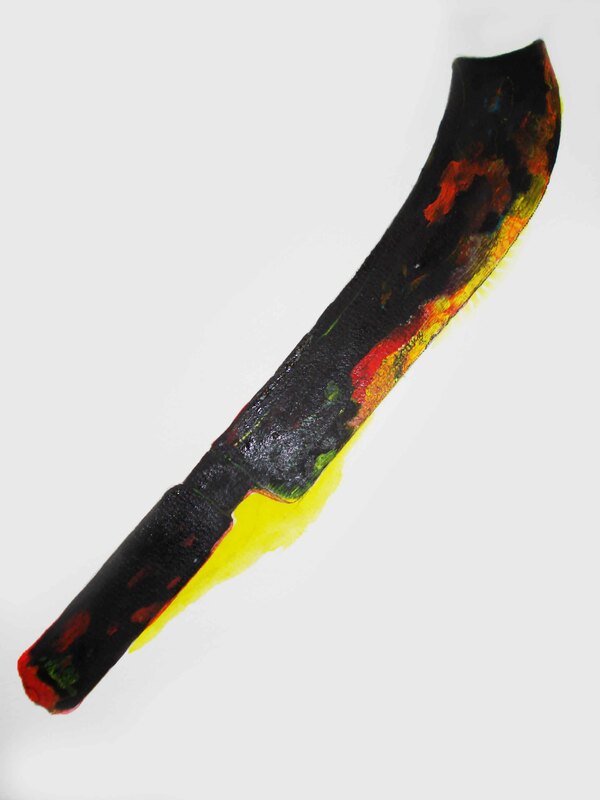 In the late 1990s Thenuwara formulated his concept of ‘Barrelism’, based on the familiar painted metal barrels used by the Sri Lankan military at roadblocks and checkpoints. 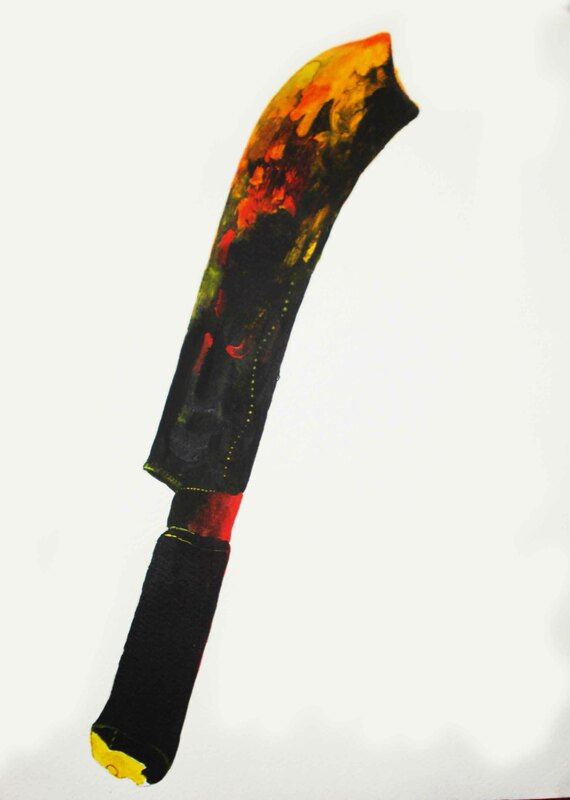 In Thenuwara’s work the objects denote state power and Sinhalese racism. Assuming totemic status, local symbols have become Thenuwara’s leitmotifs. A little younger than Weerasinghe and Thenuwara, Thamotharampillai Shanaathanan (b. 1969) is similarly dedicated to ethical responsibility. Shanaathanan is the most celebrated northern artist and a senior lecturer in art history at the University of Jaffna, the epicentre of the war in Sri Lanka’s north. Shanaathanan’s work is almost uniquely dedicated to the plight of the Tamil minority. The artist’s drawings, prints, paintings and installations have taken on an increasingly dark and disturbing aspect over the last decade. The bold lines of his extraordinary drawings often follow an unknown figure that becomes the subject of the pain that the artist feels in response to the brutal treatment of the Tamil people. Some of Shanaathanan’s most poignant work addresses the issue of Tamil displacement. Maps re-imagined in collage become layered processes of ordering and re-ordering, attending to notions of diaspora. Dispersion from the centre reverberates through Shanaathanan’s work. He explores the idea of home, in particular the seeming contradiction of a shared identity and culture in an unfamiliar hostland, with a geographical homeland destroyed by thirty years of civil war. 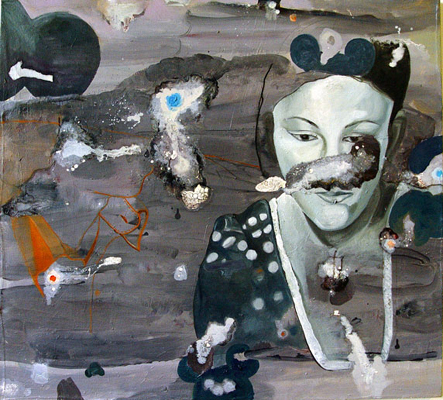 Shanaathanan was among the Sri Lankan artists to face a new challenge with the end of the war in 2009. In his ‘Imag(in)ing Home’ exhibition at the Museum of Anthropology in Vancouver in 2010 Shanaathanan approached the power of nostalgia, exploring the importance of memory in forming a collective notion of home. These three artists are compelled to integrate their convictions about society with their aesthetic preoccupations. This drive is evident too in their shared belief in the power of education. Since the end of the war each artist has conducted a reappraisal of areas of his work. Nevertheless, the end of the war cannot solely resolve their ongoing social critique, which will undoubtedly continue to preoccupy their practice. The school of artists containing Jagath Ravindra (b. 1963) and Muhanned Cader (b. 1966) can be very broadly defined by their fascination with abstraction. 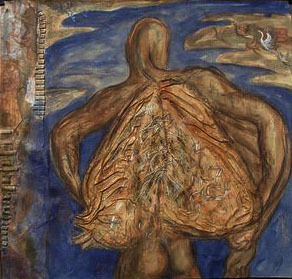 Ravindra’s work has been consistently preoccupied with the portrayal of spirituality and the human body. The work does not attend to a specific religion, but is a more universal contemplation of environment. While not as explicitly commenting on the conditions of Buddhism as Weerasinghe, Ravindra’s work still responds to the pervasive influence of religion on Sri Lankan culture. His painting is largely abstracted but highly communicative: relationships are established through subtle tonal variation and expressive brushwork, with his use of acrylic paint allowing him to communicate a sense of urgency. Ravindra believes that artists should uphold their responsibilities as citizens above those of being an artist, asserting that one’s practice must be examined regularly in order for its message to remain relevant. He is also a prominent figure in the development of art education in Sri Lanka as a lecturer at the University of Kelaniya. Where Ravindra’s technique is expansive and gestural, Cader’s methods are strictly ordered and contained. Primarily a draughtsman possessed of extraordinary spatial sensitivity, Cader’s work depicts the relationships between images, the subject matter for which has been abstracted from life. His work is often on a small scale, directed by non-linguistic representations of objects and ideas – an imaginative formula of semi-recognisable figures, animals, landscapes and doodles. Cader’s audience is presented with ‘sentences’, joined or separated into spatial cadences and phrasing, the order and narrative of which are left to interpretation. Cader’s most recent series, Coded and Loaded, is most advantageously seen in sequence – whether in a conventional linear arrangement or clustered around one another as though in verse. Cader aspires to omit direct political references from his work, but the unorthodox shapes of his canvases and non-rectangular landscapes of his other series can invite political readings. 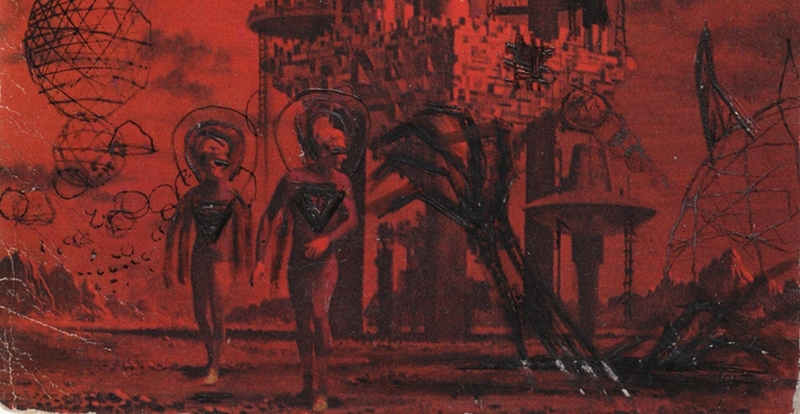 The artist’s decision to employ such formats prevents the viewer from seeing the full scene, establishing a visual metaphor for what Cader calls ‘true politics’. 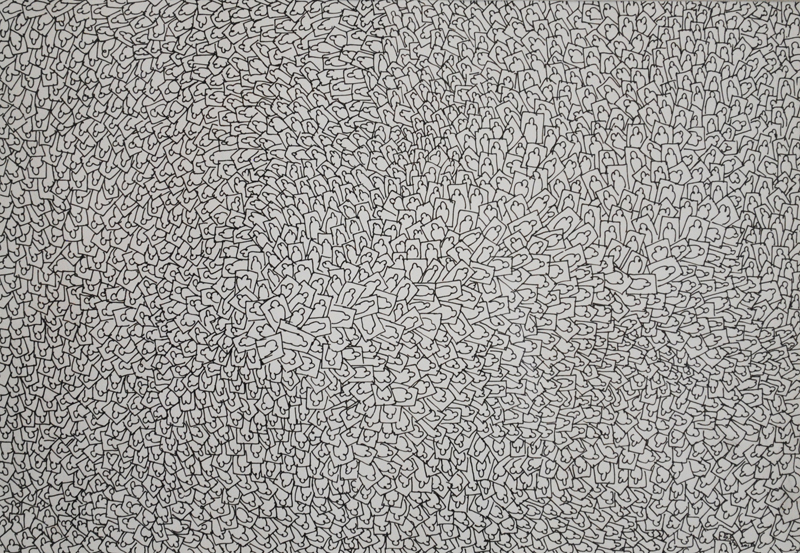 A similarly meticulous approach is evident in Sanjeewa Kumara’s (b.1971) work. 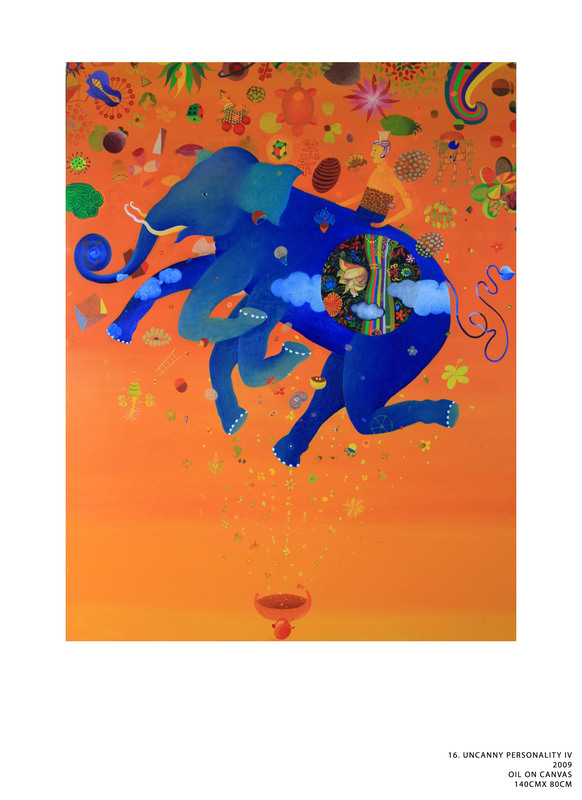 Veering away from Cader’s consistency of method and Ravindra’s intense preoccupation with the soaring celestial figure, Kumara heralds an ‘art of surprises’, with the focus on the surreal and fantastic. An electric palette fuses unlikely combinations and disconnected allusions with a sensual delicacy. Kumara strongly asserts his art as non-Western, rejecting established conventions such as pictorial balance, perspective and spatial depth. While incorporating some Western influences, such as those of pre-Renaissance, ‘primitive’ artists, Kumara situates his approach away from the Western canon (Weerasinghe has termed Kumara’s stance ‘Neo-Oriental’). He insists therefore that his works be defined as ‘pictures’ rather than ‘paintings’. Yet thoughtful allusions are contained within his hyper-effusive style. Since the early 2000s Kumara has incorporated political commentary into some of his work, mixing popular and unpopular historical elements alike with visual pastiche. Setting aside conscious political and religious commentary for the most part, Sri Lanka’s cultural history is elegantly handled by Sujeewa Kumari (b. 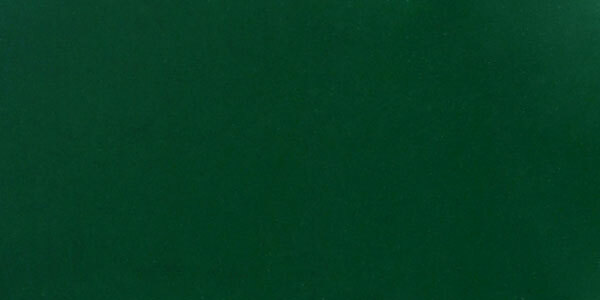 1971), one of the foremost female contemporary artists. Her work expresses the conviction that Sri Lankans are in a stage of self-discovery, and that history enables a base for growing self-awareness. The female subjects of her paintings wear the (precisely researched) dress of the immediate post-colonial era. Her figures, rendered in close detail, are typically found in abstract, textural settings. While she does address specifically female concerns, gender issues are not of primary importance to Kumari’s work. 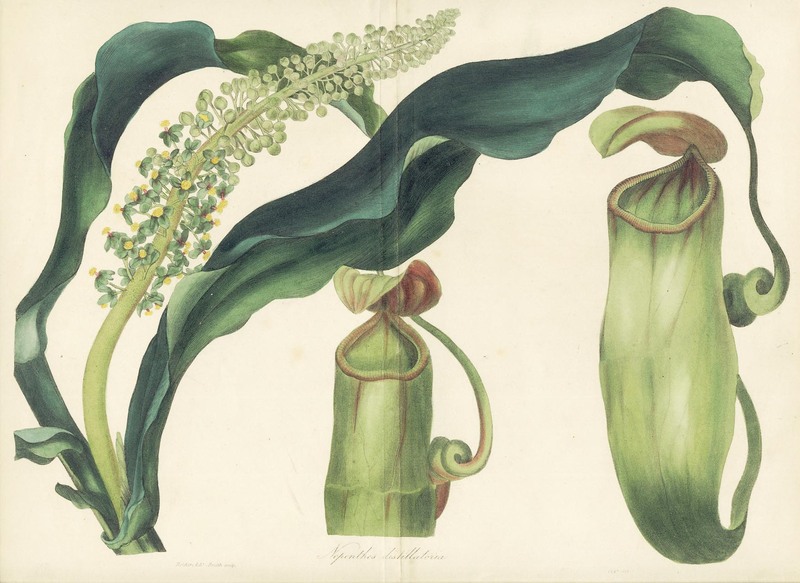 In contrast, Anoli Perera (b. 1962) works with a vigorously feminist critical voice. Perera is part of Weerasinghe’s artistic collective, Theertha, which has run an International Women Artist’s Residency for the last decade. 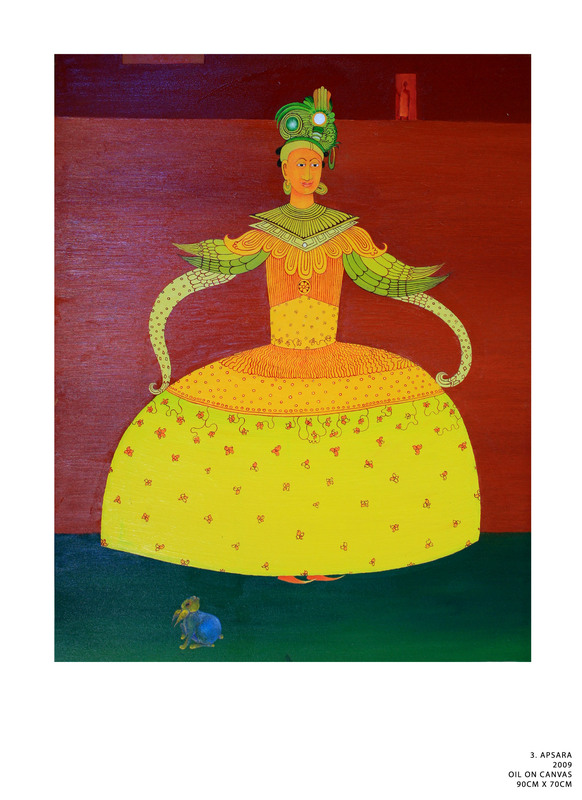 The programme was established to promote female Sri Lankan artists, but will end in 2012 having failed to meet its objectives. When female artists graduate there is still a prevailing tendency to return to domestic life. Weerasinghe feels that the challenges inherent in becoming a practising artist in Sri Lanka are not being tackled by women, despite the support offered by the initiative. A new generation is negotiating the subjects tackled by their predecessors from different perspectives. Dumith Kulasekara (b. 1979) has made a conspicuous entry into the Sri Lankan art scene with two successful solo exhibitions in the last three years, the most recent of which was entitled ‘The Symbolical Impossibility of Disavowing Trauma’. Kulasekara’s work confronts social and political issues while attending to an acutely subjective excavation of his personal history. The direct influence of freudian theory is explicit: the artist is his own most revisited subject, closely followed by his wife and mother. Self-portraits range from the more directly representative to symbolic portrayals of the self with abundantly repeated motifs including the floral and phallic. Kulasekara’s scenes present surreal mindscapes of heightened colour, incongruous figures, and sensual colour and form, which sit awkwardly against tortured and distended bodies. 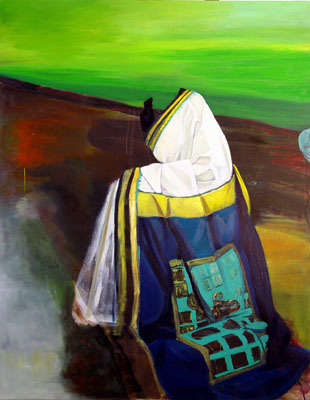 Closer to the work of his predecessors, Pala Pothupitiye’s (c. 1972) inspiration has undergone a distinct shift in recent years from social and cultural themes of nationality and cultural heritage. Exploring his ancestry as a member of the Sri Lankan dancing caste, Pothupitiye employed and adapted traditional methods of local craft. Thus placing himself within this culture, he also sought to stake out his own identity. The end of the civil war proved to be a moment of profound change for the young artist. The immediate post-war period inspired and troubled Pothupitiye, leading to a solo exhibition at the Saskia Fernando Gallery entitled ‘Katugaha and Mythical Landscapes’. The work deals with the idea of ‘geopolitical landscapes’, addressing the extent to which our understanding of an environment is defined by political considerations. 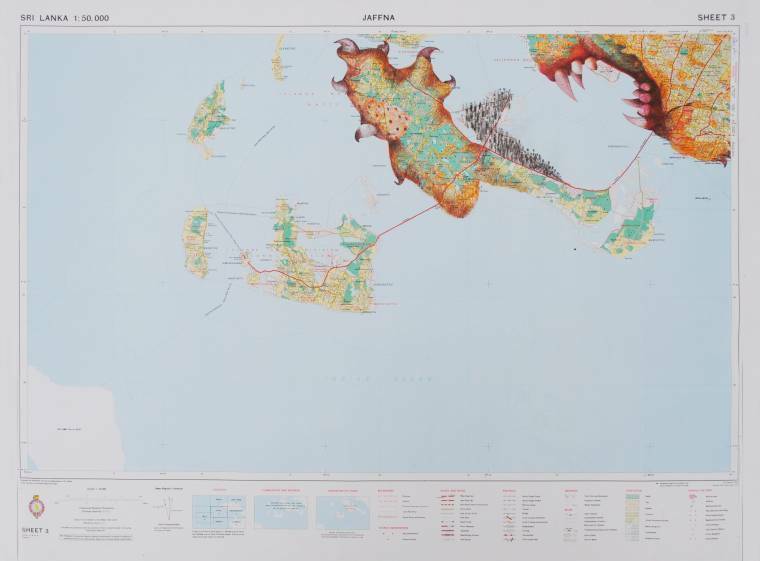 Shortly prior to this work Pothupitiye produced a series of re-worked survey maps of the island’s northern coast. Inlets and islands are transformed into the roaring jaws of a tiger rendered in red ballpoint pen, while headlands become the angry faces of lions, drawn in pencil. Together the lion, Sri Lanka’s national symbol, and the tiger, in reference to the rebel Tamil Tigers, form the composite ‘liger’, a motif which now recurs in Pothupitiye’s work. The infrastructure of the Sri Lankan art world is slowly expanding to match the artistic developments of the last twenty years. As contemporary art has always had a small audience in Sri Lanka, it has often been presented in tandem with design and architecture. Successful commercial models exist in multifunctional spaces, bringing a restaurant, design and craft element, bookshop and art space under one roof. The Gallery Café, founded by Shanth Fernando, and Barefoot, run by Nazreen Sansoni, followed this model in their efforts to exhibit the best Sri Lankan and international artists. The Saskia Fernando Gallery, established in February 2009, was one of the first independent white cube galleries in Colombo. Artist-led projects also contribute to the scene. In the absence of more curators and galleries, artists assume multiple roles to encourage the diversity that they envisage for Sri Lankan art. The art collective Theertha was founded with the aim of transcending ethnic and regional borders through artistic connections. In 2007 the Red Dot Gallery was opened by the collective to show innovative art by progressive contemporary artists. Theertha is part of the South Asian Network with India’s Khoj International, Vasl in Pakistan, Sutra in Nepal and the Britto Arts Trust, based in Bangladesh. Artists often take it upon themselves to curate their own exhibitions. 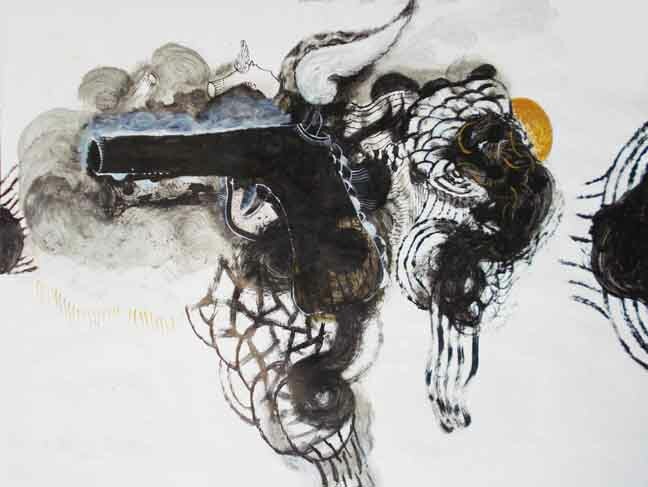 In August 2010 Chandraguptha Thenuwara organised ‘Visual Responses During the War’, a significant show of twenty-two artists held at both the Lionel Wendt and Harold Pieris Galleries in Colombo. Thenuwara also participated in ‘The One Year Drawing Project’ with Cader, Shanaathanan and Weerasinghe, a remarkable reciprocal drawing project curated by Sharmini Pereira, and commissioned and published by Raking Leaves, which took place between May 2005 and October 2007. 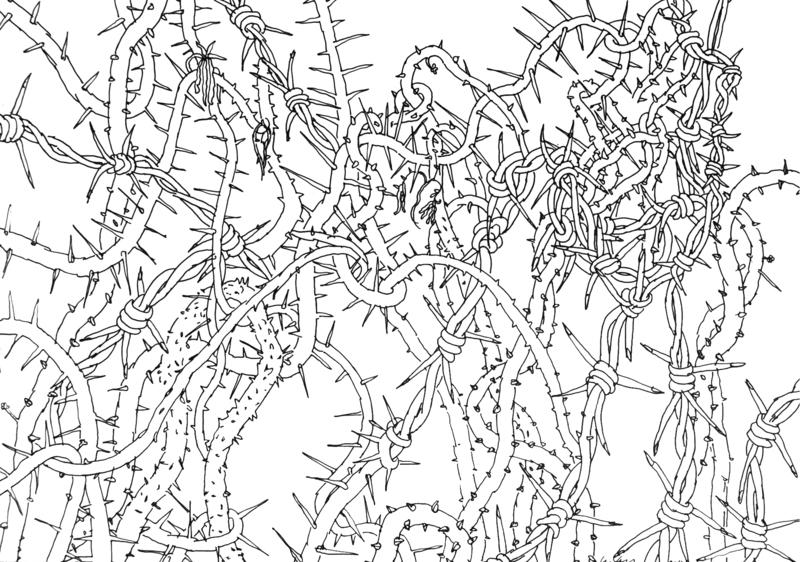 These different strands collectively represent the support network for Sri Lankan contemporary art. This infrastructure needs nurturing through education and exposure, which will take time. Diversification is vital to the success of the project, and efforts are being made by the University of Jaffna, for instance, to promote artists from the ravaged north. Artists from the south largely recognise and support the development of northern artists. Contemporary art in Sri Lanka is largely ignored by the general public, and the government makes little effort to change this. Any art that is less commercially viable therefore tends to fall into obscurity, irrespective of its merits on historical, political or aesthetic grounds. Much of the best work is exported or stands in private collections, meaning that the public is denied the opportunity to engage with it. The absence of critical writing is also keenly felt, further obstructing wider recognition for the work. But each of these areas will grow in concert with the others. as elsewhere, a greater diversity is key to healthy development. Sri Lanka has its own history of modern art, with a formative modernism that paved the way for contemporary art. The past twenty years have seen a revolution in artistic perspectives. Art has become a forum in which to raise difficult issues, whether political, personal or universal. The generosity of older artists with their time and energy has fostered a persistent atmosphere of investigation, exploration and reaction. Sri Lanka’s artists are courageous, vocal and prolific. Their work deserves wider exposure and recognition. is a London-based curator and writer. She is the director of art dealership HRL Contemporary and co-curated 'Contemporary Art from Sri Lanka' at Asia House in March 2011.